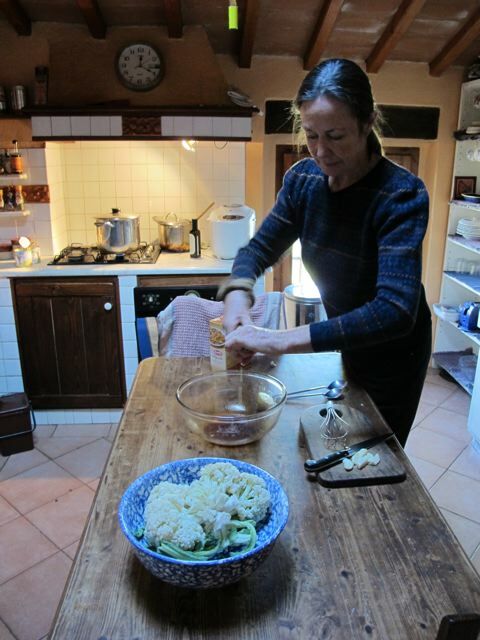 Helen, our hostess here in the Tuscan hills, is an insoucient cook–(a quality I have yet to achieve). She will throw some of this and a little more of that into her tall saucepan and very quickly the aroma of lunch fills her kitchen. Angelino, one of our host Keith’s expert olive picking team, brought up a very large cauliflower from his garden one morning last week and Helen made a sauce of olive oil, paprika and lemon juice to bathe it in before roasting it in a moderate oven for 40 odd minutes. She served it with slices of pork fillet roasted with rosemary from her garden the night we arrived. The cauliflower dish turned out to be one of those you find your fingers sneaking back to when the hostess isn’t looking. Ju-ust one more little piece…uum! Helen says she’s happy for me to reproduce the recipe here. In a large bowl whisk the oil, paprika and lemon juice together into a dark red viscous sauce. Add the cauliflower to the bowl and turn them over and over in the sauce. Spread out the cauliflower in a shallow roasting tray. Roast in the oven for about 40 minutes. Don’t expect much left over!! Meredith, not usually a fan, gave it the thumbs up as the best cauliflower dish she’d ever had. Insoucient… I like it. That is how I cook most of the time. It only got me into trouble one time, when I tried to duplicate a spaghetti squash dish I’d had at a restaurant. Disaster! That was the first and last time my husband ever encouraged me to throw away food. This sounds lovely – about what temperature (high, medium, low?) was the oven please? Will definitely have to try it! It’s almost as if you could sprinkle a little parmesan cheese while you are baking it and making a gratinee. Perhaps that will draw the kids in. Anything to draw them in to vegetables! Now Robin this is another nice way to eat cauliflower,along with the dish of yours the other day.This veg always seems to promise so much but when just cooked in water what a disappointment, it just lays there on the plate, these two,variations give it some spark,it’s on the menu for tomorrow. Whoops – spotted the temp at the top of the page! I forgot to bold the oven temp.,Dilys–so it wasn’t easy to spot. I noticed that in the photo it looked like Helen had some garlic on the chopping board so was that for another recipe? Sorry for my eye for detail but I do love looking at peoples kitchens as they are interesting and say so much about them. In Oz lingo I am called a “sticky beak”. potatoes! Be not afraid of cream and butter! Butter has anti-tumor butyric acid and cream is just good for your soul! This sounds delicious and a welcome change to the usual cauliflower gratin or plain florets. Will try this for tomorrow’s supper party to accompany a pheasant caserole with chesnuts in a cream (or creme fraiche) and brandy sauce and will serve some of our own frozen french beans for colour! 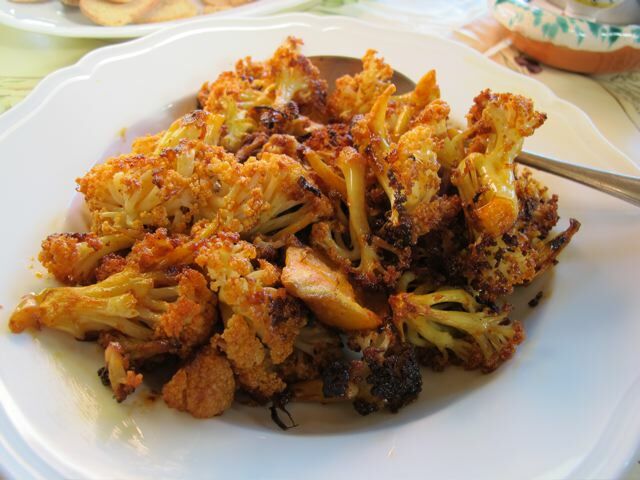 May also add some sun-dried tomatoes with the cauli dish to add to the autumnal colours. Can’t wait to get cracking tomorrow morning when I get back to the West country from verking in London! Thank Goodness for weekends! Still very much enjoying the blog! on November 17, 2011 at 12:04 pm | Reply Dianne P.
MMM! Another lovely-sounding dish to make this weekend! I like that there’s just a few ingredients (for us simple-minded cooks!) Thanks, Robin! Looks yummy. There’s a cauliflower in my fridge waiting to be transformed. Good luck with it, Sonia! It looks wonderful – cauliflower is a difficult vegetable so I’m always glad of a new take on it. Cooked the cauli dish last night, Robin. I agree – delicious! What you failed to mention was the amazing aroma that wafts out of the oven; much better than the usual smell which is not that enticing…. It is definitely being added to my recipe collection, thank you.